Some cats are able to kick up more of a mess when using a litter box than many owners would be capable of believing. It can leave you frustrated and fed up, but many owners are turning to top entry litter boxes to solve their problems. Having litter scattered all over your kitchen floor daily soon gets to be a major annoyance. A box of this style solves this issue immediately and for very little expense, you’ll also be pleasantly surprised how easy it can be to get your cat to use one. Through all of our woes and frustrations over the years, we’ve tried a good few top loading litter boxes, some great and others, well, not so much. With all things considered, we have to put the Clevercat Top Entry Litterbox at the top of the list as the best top entry litter box available today. If that doesn’t tickle your fancy, not to worry. We’ve highlighted a few other contenders for the throne and we’ll look at them in some depth shortly. Before we get in to too much detail on what we like about each model, let’s quickly look at the options out there. The following table should give you an overview of each of the top entry litter boxes we’ve ranked as the best around and how big they are. 7 How do top entry cat litter boxes work? 8 What are the benefits of a top entry litter box? 9 Do cats like top entry litter boxes? 10 Why won’t my cat use their top entry litter box? 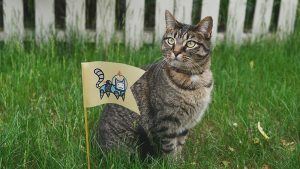 11 Are top entry litter boxes suitable for large cats? We can’t rave enough about how much of a difference a good litter box can make to your daily life as a cat owner. Having a top entry litter box keeps the mess to a minimum and means you only have to deal with cleaning up litter when it’s absolutely necessary. When your cat jumps back out of the top of the litter box after doing their business, their paws first land on the roof of the litter box. This roof has holes that mean a large percentage of the dust stuck to their paws falls straight back in and doesn’t track across your floors. Wonderful right? Let’s take a closer look at what we think to be the market leaders in terms of function and value for money. Here is a list of the best top entry litter boxes that will help to stop litter tracking through your home. To the best of our knowledge, this seems to be the most popular top entry litter box for cats on the market today. Our experience in using it has left us with no doubts as to why. It’s sturdy, simple and super effective. The zig-zagged top makes sure litter and dust falls quickly through and back down into the box. It’s a pattern that our cat seemed to be the most comfortable walking on, too. The simplicity of the Clevercat box seems to be your best hope of getting your cat into a top entry litter box without too much fuss. It does a great job of enclosing smells too, we hadn’t been expecting to notice much of a difference, but the lack of any seams or detachable covers mean that odor is contained very well. The same solid molded plastic bottom makes it super, super easy to clean. This is one of our biggest reasons to rank this as the best top entry litter box, since a quick empty and a wipe down with soap and water is all it takes. No hard to reach places. Take a look at how pretty this thing is! It’s by far the best looking cat litter box we’ve ever laid eyes on, and you’ll be pleased to hear that there aren’t many sacrifices made in order to look this good. It also excels practicality-wise when compared to it’s competitors. The removable and re-usable liner that you’ll find inside the box makes emptying and refilling a total breeze. Some have reported issues with urine soaking into the seams of the lining after prolonged use, but by using enough litter to stop the urine reaching the bottom, you’re sure not to see any issues. It comes with a free scoop as you can probably see from the product image. 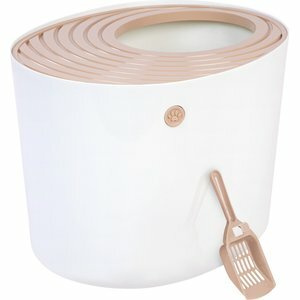 The scoop clips nicely to the side of the litter box for storage and works as well as you’d hope a litter scoop would. The 9 inch diameter entry hole is perfectly situated at a corner, meaning your cat is pretty much forced to hop out onto the perforated roof and clean their paws there before hopping onto your carpet or furniture with dusty paws. We can’t recommend it enough, and we’re sure we’d have it as the highest rated top entry litter box if it wasn’t for the price difference between this and the Clevercat top entry litter box. It’s hard to justify given that they both essentially do the same thing, this one just looks way prettier. Check out more photos using the button above. The Petmate Pan is the best budget top entry litter box around, so it’s no surprise that it’s also one of the most popular. It’s priced at approximately half the cost of the next cheapest top entry litter box on our list, meaning you get incredibly value for money. Thankfully, it’s super easy to clean too. Just pop the lid off and you can wash it out with soap and water in no time at all. The opening is ever so slightly smaller than the Clevercat and Modkat models, but it’s not much of a noticeable difference. You don’t get the luxuries of removable and reusable linings, but you don’t really expect any fancy extras at the price it’s sold for. All in all, it’s a safe, reliable and simple budget option that’s perfect for owners who want to try out a top entry litter box before committing to spending on a higher end brand. The IRIS Top Entry Litter Box is our middle ground pick. You get a fantastic balance of value and design. Its grooved lid is easy for cats to walk on and gives you a visible indicator of just how much dust and litter it collects. It looks lovely, in our opinion, and we were pleased to see it comes in a range of different colors that should match any modern decor in your home. As with any respectable brand, all plastics used are entirely BPA free and safe for your kitty. The larger opening makes it a better fit for larger cats than the Modkat litter box. If a stylish litter box is what you’re aiming for but you have an exceptionally large cat, this is the one for you. Rounded inside walls mean it’s easy to wipe down quickly and keep clean, and the lid does a great job of keeping dust and litter off the surrounding area. Really impressive for the price. Here we have something a little different. It’s not only the biggest litter box on our list, but also the only one with a removable top. 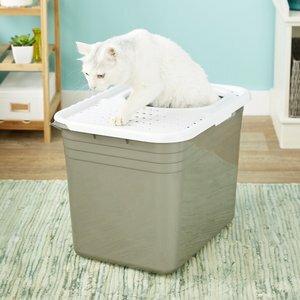 The ability to use it as both a top entry litter box and a regular one means it’s an excellent asset for those who have trouble getting their cats to use the entry hole. Leaving the litter box out in the open with the top off will show them that it’s just a normal litter box. The top is pretty much see through, which is both a positive and a negative depending on how you look at it. A see through top means you’ll be able to see when it’s been used easier, but also takes away the privacy aspect that cats seem to love about enclosed litter boxes. How do top entry cat litter boxes work? Top entry litter boxes are fantastic because they offer a cheap solution to covering up litter and reducing the mess your cat makes. In most cases, you can even do away with an unsightly litter mat. They work firstly by enclosing the litter so that it cant be kicked out of the box and all over the floor. It’s pretty clear from the design (and the name!) how they manage this. A second benefit of a top entry litter box that most people wouldn’t think about is the grate-like shelf on top. When it’s time for your cat to return to their daily life of relaxation, they must first climb out of the litter box and onto the grate. This gives a chance for the litter and dust that’s stuck to your cat’s paws to fall between the cracks and back into the litter box where it belongs. If you use it alongside a cat litter that doesn’t produce dust, you’ll see even better results. Your cat then hops out with little to no litter left in their paws and carries on with their day, leaving you with a nice clean floor. 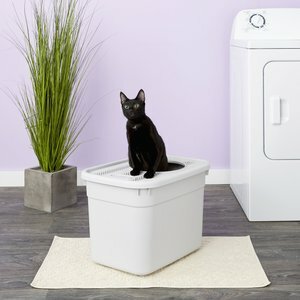 What are the benefits of a top entry litter box? They’re extremely neat and tidy for one. They look so much better than open litter boxes (especially after they’ve been used!) because they keep all the business hidden away. This style of litter box is also pretty dog proof. If you have both dogs and cats, then your dog pawing at the litter can cause an unwelcome mess. These dog proof litter boxes solve your problem completely. The simple design means that they’re super affordable too. Compare them to automatic cat litter boxes and you’ll soon realize why so many owners prefer a top entry litter box to one of those. Spoiler alert: they’re literally a fraction of the price. We found they do a good job of keeping smells locked in, especially if you use a odor control clumping litter. Unlike self cleaning litter boxes, they’re light and easy to move around and require no power source, so the placement is more flexible too. Do cats like top entry litter boxes? Most cats actually prefer a top entry litter box after the initial suspicion is overcome. 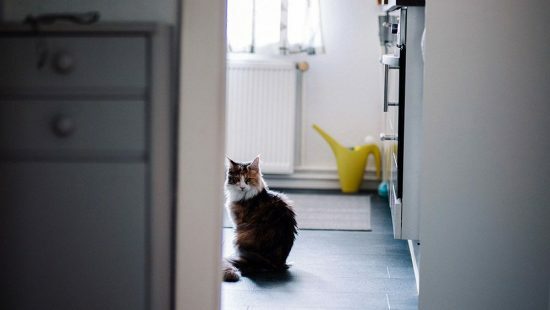 You might be surprised by this answer because cats are notoriously fussy with absolutely anything that pushes them slightly out of their routine. The reason they prefer it comes down to privacy, of course. 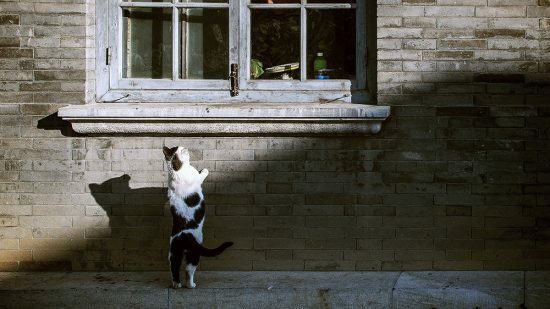 If you’ve ever seen a cat go to the toilet outside, you’ll notice they take a real good look around beforehand. They do this because they’re preparing to be vulnerable for a short while, usually out in the open. An enclosed litter box means they are covered from all angles except one, so they’ll be much more relaxed and happier to do their business in their box. Why won’t my cat use their top entry litter box? Okay, we know we just said they often prefer them, but there’s always one, eh? If your cat is struggling to get to grips with their new top entry box, there are a few tricks you can try to coax them into using it. Their reasons for refusing to use it are usually rooted in confusion rather than protest (providing the litter is up to scratch). Trouble with the new litter box could be down to the litter. If you’ve recently changed litter then it can take some getting used to. 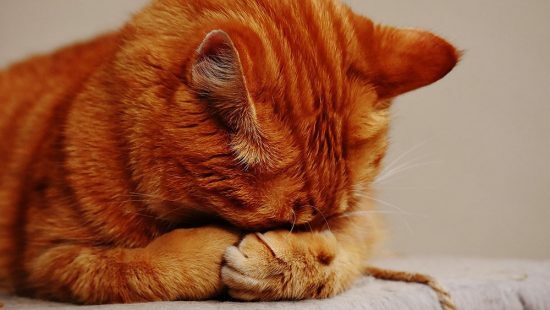 A surprising amount of cat litters on the market today are unpleasant for cats. This can be due to excessive dust or a coarse texture, so opting for a good cat litter from a respected brand is paramount. If you have older cats, they may be finding it difficult to climb in and out of the box. Keep a close eye on them when it’s time and should this be apparent, you’ll have to try something else, unfortunately! Make sure your cat knows what it’s for. If the litter box has a removable top, then you can try removing that and placing them in the litter as you would a kitten. Take a gentle hold of their paw and scrape at the litter with it to show them the texture that’s beneath them. Afterwards, place the lid back on, make sure they’re aware of the entry at the top of the litter box, and let them handle the rest. More often than not, the above will do the trick. If you’re still having trouble, it may be a good idea to place the new and old litter boxes side by side so that they associate it with a place that’s safe for them to do their business. Are top entry litter boxes suitable for large cats? Most of the options on the market are perfectly sized to accommodate cats of all sizes without taking up the whole room in the process. If your cat is especially large however, then it goes without saying that you’ll be needing to focus especially on top entry litter boxes for large cats. Luckily for you, we’ve listed the dimensions of each of our favorite litter boxes in the table above (in case you missed that! ), if you pick a big one and read the reviews by clicking through on the button, you’re sure to find plenty of stories from owners who can put your mind at ease.